For many countries international trade has been facilitated by international standards. However, those standards are also a form of non-tariff barriers when developing countries export their products into the developed world. Therefore, vital and sustainable local standardisation processes with a rich involvement from private and public sector is of key importance to build necessary technical capacity on the concepts and methodologies of different international standards. 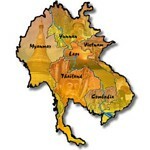 During the regional integration of the ASEAN, it has recognized that “systems of standards, quality assurance, accreditation, and measurement are crucial to promote greater efficiency and enhance cost effectiveness of production of intra-regional imports/exports.” This is essential to ensure the free flow of goods and services across borders in the region and thus would contribute greatly towards turning all the 10 Member States of ASEAN into a single market and production base. 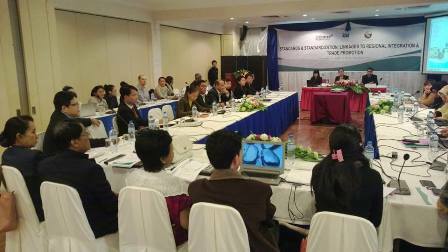 It is against this background that CUTS International – Hanoi Resource Centre (HRC) organized a two-day seminar on December 17 – 18 in Vientiane, Lao PDR in cooperation with Mekong Institute and Swedish Standards Institute (SIS). 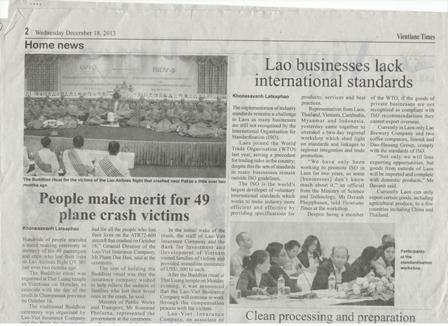 There were 40 representatives from National Standard Bodies, Ministries of Industry and Commerce, Chambers of Industry and Commerce as well as several export-oriented enterprises from Laos, Thailand, Indonesia, Myanmar, Cambodia, Singapore and Vietnam taking part in the event. They shared and exchanged their view on significance of standards and standardization process as well as impacts on regional integration and trade promotion. And it was also an opportunity to collect feedbacks on national, sub-regional, regional and international institutions for more inclusive and effective standardization process at all levels.